Industrialized cities often experience problems when it comes to waste disposal. Bulky trash and toxic wastes like radio-active materials can cause irreparable damage to the environment in addition to posing a hazard to human health if left unattended. It is also not unusual to find people sustaining injuries during trash removal. Most injuries are sustained when loading heavy bags onto the back of the carrier that transports the trash to the dumpster. The weight of the junk can also cause injuries as worker attempts to lift them off the ground. Here are some critical rubbish removal guidelines that will ensure safety during waste disposal. When most people think about harmful waste, the first elements that comes to their minds are chemicals and medicals wastes like needles. However, other substances like solid human waste and industrial cleansers emanating from business premises are equally hazardous. These carry toxins and bacteria that can adversely affect your health. With that in mind, ensure to wear thick gloves when handling trash cans or when transferring junk from one can to the other. Lifting heavy loads can cause physical injuries especially when you fail to exercise caution. For instance, you need to test the load before lifting it to avoid straining your back. Get help if the weight is too heavy and if you feel like you can raise it, ensure that you use proper lifting techniques. Such include bending your knees and keeping your back straight when lowering or picking up trash. When placing the garbage in a bin, do not use one hand to hold the lid and the other to lift the waste. Instead, open the top wide and use both sides to raise the trash. Always put the trash bags close to your body when carrying them to prevent twisting motions that can cause injury. Also, ensure that you isolate sharp objects before lifting the trash to prevent your body from sustaining lacerations and cuts. You can avoid having to raise heavy loads by frequently taking the garbage out to the garbage can or using smaller bags. It’s also imperative to adhere to the policies regarding the appropriate disposal of bulky waste while ensuring that sharp objects such as broken glasses are dumped separately. Depositing heavy trash bags into a dumpster requires a lot of effort, and it also involves awkward postures. This is because dumpsters are often taller than the average person. Therefore, you need to buy a step up a platform that will help you or your employees to get closer to the rim of the container. Ensure to instruct your workers to handle trash bags with their feet and entire body facing the dumpster and while standing as close as possible to the garbage can. They should also try and avoid twisting the trash bags sideways as much as possible. Injuries related to heavy loads can lead to severe and permanent injuries. 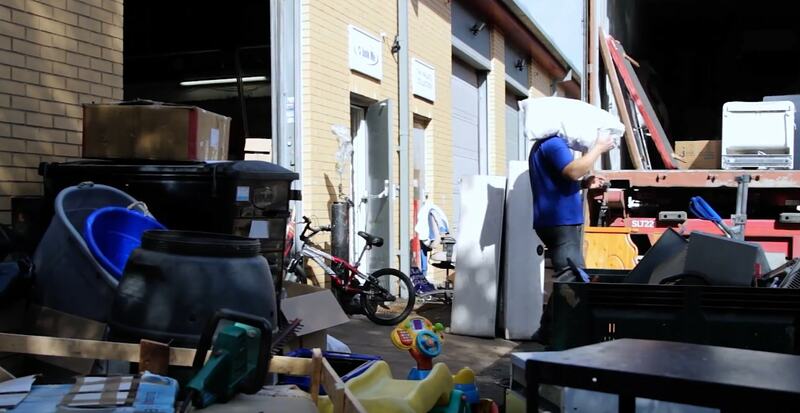 It’s, therefore, imperative to implement appropriate junk removal practices. Trash should also be handled while wearing protective gloves to avoid contacting dangerous bacteria while also preventing your hands from sustaining cuts. Both employer and business managers should form a culture that promotes safe and effective junk disposal.